Bill Anhut is in the far left of the photo. Patrick Wegeng, Arlington County PRCR staff in charge of the program is in the center, on the truck, smiling. 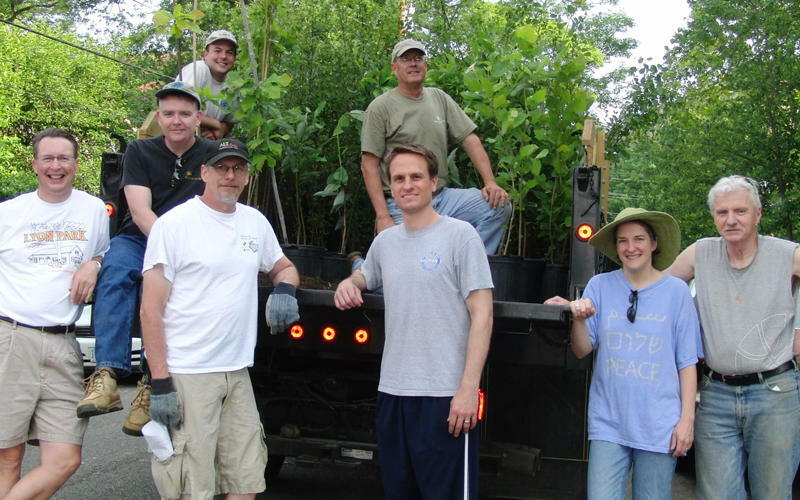 This spring, approximately 60 neighborhood and condominium associations provided tree coordinator volunteers to find “forever homes” for 580 Sweetbay magnolias, 380 River birches, 155 Swamp white oaks, and 125 American sycamores. TreeStewards participated as coordinators, and also provided ongoing tree care education. Homeowners who asked received visits from a TreeSteward volunteer to help determine the Right Tree/Right Place for their yard. In Lyon Park Civic Association, TreeSteward Bill Anhut trained a group of volunteers who planted more than 60 trees throughout the neighborhood in one day! They ensured the trees were started off in the right way and made a lasting contribution to the quality of the environment. This entry was posted in Community Service and tagged community, planting. Bookmark the permalink.